Neat tan leather bag with an adjustable cross-body strap. Useful additional outer zipped compartment for fast access as well as interior pockets. Zip top closure. Cotton-twill lining. Perfectly shaped to hold a camera but not padded. W15cmH16cmD6cm. Very nice bag, just the right small to medium size. Beats logging a big bag around which I got into lately. My camera has found a space in it too in addition to purse, keys and bits and pieces. The outer pocket with zip is practical if I need something in a hurry. 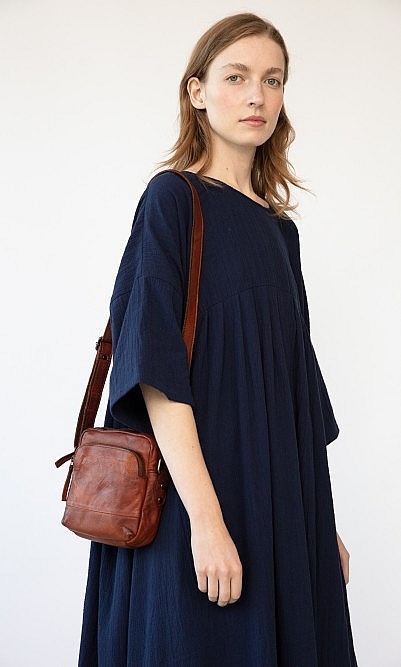 The shoulder strap is long & adjustable which is great - I love wearing bags cross-body. All in all a very good back.